THIS CONTENT ONLY AVAILABLE TO FOODABLE+ MEMBERS. On this star-studded panel, we’re talking to emerging brand CEO’s about the keys to growing business in today’s environment. Nicole Marquis, CEO of HipCityVeg, Andy Duddleston of The Little Beet, and Jeff Drake of Protein Bar & Kitchen open the panel discussing gaps they’ve seen in the industry and their motivations to fill them. These panelists all have something in common, their mission to offer better food. Nicole Marquis went to college to study Shakespeare and used her restaurant job to pay her way through school. In the process, she worked her way up the ranks working every position in the restaurant up to manager. But everything changed when she became a vegan. Duddleston’s story is a little different in that his passion wasn’t so much food as it was people, and creating great teams of people. As a member of the Peace Corps and AmeriCorps, his missions continued to be people-centered. Jeff Drake had been at the head of a number of concepts before Protein Bar & Kitchen and now Protein Bar is really pushing the “better-for-you” space. Drake talks about adding “& Kitchen” to their name to give more clarity to their witty name and how that has spread to re-working their menu and restaurants to better convey their mission as a dining space. One major topic these panelists discuss is the Millennial consumer segment and their dining habits. According to Foodable Labs, Millennials are showing a decrease in the number of times they dine out per month. However, dining occasions among the same segment are up for Healthy Halo concepts. These top brands agree that they are performing well because their brands align with the values of their guests. The role of technology like smartphones, social media, and apps has really proliferated in the restaurant space. It has created incredible access to information, creating an informed consumer who is looking for better food not only in taste and health but in sourcing, sustainability and more. And as Duddleston points out, eating for millennials is much more than just fueling the body. Drake adds that Millennials have a much lower tolerance for friction. They want to be able to come into a concept in any given day and be able to interact in a way that is best for them. This is why face to face still exists but also why app order pick-up has grown so much recently. “It’s gotta be thoughtful, the packaging has to be thoughtful, the setup has to be thoughtful. All of those things… You don’t put the food in the bag, you have the bag available because you know plastic bags or paper bags and all of that is important to the consumer so let them make that decision if that’s how they want to use your brand for that experience,” Drake urges. 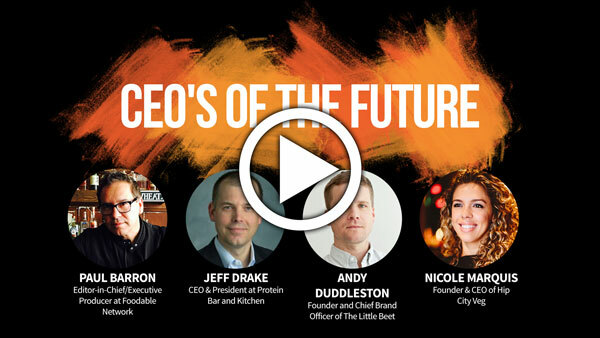 These CEOs talk specialty foods, vertical and rooftop farming, innovations in plant-based and more in this eye-opening episode. Check out all that in more in this episode from Foodable.io on Foodable+.